Thaddeus Kornegay was born July 13, 1987 in Trenton. Both of his parents worked for GM. Quick, strong and agile, Tad stood just 5 feet tall when he went out for the Hamilton West varsity. Nevertheless , he starred for the football team, which he captained as a senior in 2000. That year he earned second-team All-State honors and was named first-team All-County. Tad also lettered for the basketball and track squads, earning All-Area honors in the long jump. Tad earned a football scholarship from Division–IAA Fordham University. He played defensive back and returned kicks for the Rams and was an All-American his senior season in 2004 and Patriot League Defensive Player of the Year. Tad went undrafted by the NFL in 2005. As 5’10” he did not project as a shut-down cornerback. His game was better suited for the CFL, so he signed with the Hamilton Tiger-Cats. Tad was in and out of the starting lineup for Hamilton and was traded after two seasons to the Saskatchewan Roughriders. They made it all the way to the Grey Cup and beat the Winnipeg Blue Bombers 23–19 to win the championship. Tad was voted one of the CFL’s T0p 50 players that season. A valuable special teams performer who could play at corner or safety, Tad earned the nickname Mr. Everything. He had an All-Star year in 2009 at linebacker, starting all 18 regular-season games and intercepting a career-high 3 passes. Saskatchewan finished first in the CFL West for the first time in 33 years and returned to the grey Cup. This time, the Roughriders looked to have the game won 27–25 when the Montreal Alouettes kicker missed a field goal. But Saskatchewan had too many men on the field and Montreal made good on its second try to win 28–27. Saskatchewan made it back to the Grey Cup in 2010, but lost to the Alouettes again, this time 21–18. Tad finished his career with the British Columbia Lions and Calgary Stampeders, retiring after the 2012 campaign. 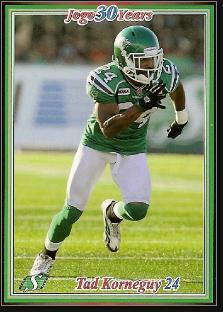 He signed a one-day contract with Saskatchewan so he could retire as a Roughrider. He continued to work as a trainer at the Tests Sports Club in New Jersey, working with elite-level athletes.